Hey guys! I'm back. Sorry I have been gone for such a long time, but here I am, and I'm ready to start talking about food again! Food, and drinks, and a few new tools that I got recently that have changed my life!!! 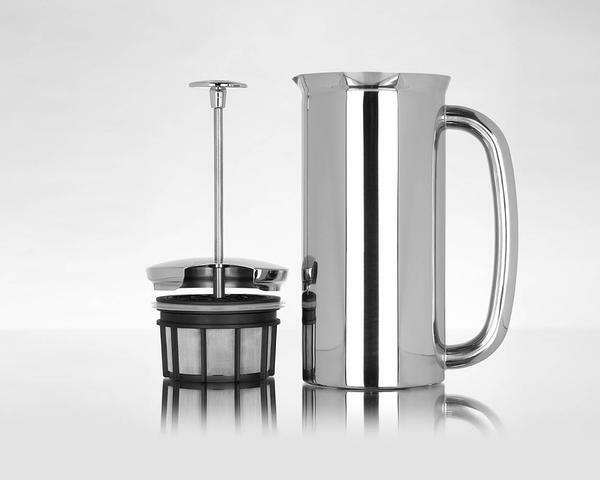 So to start off I want to introduce you to the Espro French Press. This has changed my mornings for good. Normally I am a Starbucks in the morning kind of guy. I do not enjoy making my own coffee, and it never tastes the same as it does when I go to the coffee shop. While we were living in LA we had a k-cup coffee maker and that was nice enough. I used it often, but still loved to take a ride to Starbucks. Now we are back home in NYC, and our kitchen was too small for a coffee maker. So every morning, right after waking up, it was time to head out and walk the 2 blocks to get our coffee. That was all fine and good, but something happened... that something was called WINTER!!! OK so if you have a 2 or 3 people coming over for lunch, and you don't have much cash on hand, I have the solution. For about 20 bucks you can serve a great looking and great tasting steak sandwich guaranteed to satisfy. But you should tell your friends to bring the wine! So get yourself to the store. Somewhere you know you can get a good deal but still get quality food, like Trader Joe's. You'll need to first get the steak. I love Flank Steak, so thats what I got, but you can go with whatever you like. You'll also need to get a couple medium to large tomatoes, lettuce, some flat bread (round if you can find them), and Dijon Mustard. That's it!! When you're ready to cook, start by generously seasoning the steak. I used salt, course ground black pepper, garlic powder, and a little parsley flake (my usual go to's), and a little olive oil. So right now it is 101 degrees outside, which means I am not leaving my house until its dark out! That also means it's time to do some chores. One chore I had on my list was that I needed to make some pesto. My basil plant was getting too big and I needed to cut it back. 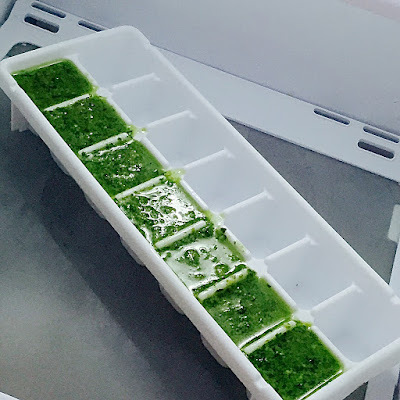 I had no use for it right now so pesto was the best option, and then freeze it. That got me thinking that I wanted to get a few tips out there in the world. You can make a pesto with pretty much any green that you have in your house that is on the verge of going bad. DON"T keep wasting money by tossing out greens that go bad. You can make a pesto with Spinach, Arugula, Kale, Chard, Parsley.... I think you get the idea. You can also use different types of nuts. They don't have to be pine nuts. Today I used Wall Nuts. I also like Pistachios too. First thing you need to do, right now, before even finishing this article is to click on this link and get yourself a Kitchen Active Spiralizer! What it does, if you aren't familiar with them, is twist zucchini and other vegetables into strands that resemble spaghetti. So, this is perfect for Paleos, vegans, vegetarians, low carb dieters, and people on raw diets. You don't have to cook the spirals. As you can see in the photo above, after you let the veg sit in the sauce you desire to use, things like salts or acids will break down the vegetables enough to make them soft. Of course if you choose to use a hot cooked sauce, that will soften the veg too. So what I have for you here is a raw pasta salad with a spicy Peanut sauce, with grilled Shrimp on the side. Now obviously if you left the Shrimp out, this would be vegetarian,vegan, and raw. I don't think it's paleo though. I believe paleo does not allow peanuts. So It seems that I am the last person on the planet to know about the AMAZING health benefits of Sauerkraut. To be 100% honest our dog got really sick this week and we were researching how to help him out without having to spend a fortune at the vet's office. We kept reading that the dogs health and overall well being started off with how his gut was, and what was going on in his digestive track. JUST LIKE PEOPLE. And the way to make sure that your gut is healthy is probiotics! 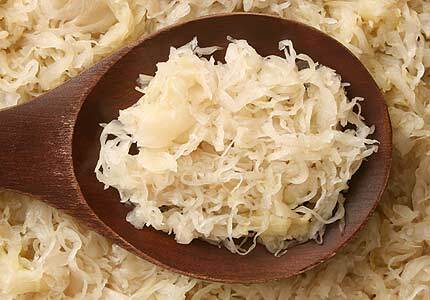 One of the easiest, and least expensive ways to get billions of these things in you a day is with eating fermented foods like Sauerkraut. Here is a link to a REALY interesting article I found about the science of probiotics, mental health, gut health, becoming healthier. Panzanella Salad: Because when you find a good Baguette you celebrate it! Yesterday I decided to take a quick trip to the beach and jump into the ocean for a swim. The water was perfect and as I laid out in the sun to dry off I started planning my route home so that I could also shop for dinner along my way. Once I was dry I walked back to my car and was on my way. I walked into a little market by my house, and the first thing I saw were baguettes. They called to me and I responded by putting one in my basket and deciding that I needed to make a Panzanella Salad. If you don't know, Panzanella is basically an old school Italian way to use stale bread. You cube your bread and whatever veg you have and toss in a vinaigrette. You let it sit the the bread softens up, and then you eat!! So since I bought a fresh baguette, and you probably will to when you make make this, we'll have to toast the bread. But before we get to that lets talk veg. So it's week 3 as a Californian, and I have yet to get food out of a truck. So tonight I went to Fresco Market in the Monterey Hills, and there they were! I forgot it was Monday, and they have food trucks there every Monday night from 5:30 until 9:30. I was there to buy stuff to make a salad, but that plan side tracked quickly. Out of the 3 trucks that were there I chose the truck with the fish tacos. Only because out of the options, that's what I wanted. I read the menu and decided to go for what seemed to be their most popular dish. It's called a "Sayulita Fish Taco" It's fish, deep fried in an old school dark beer batter, original SFT sauce, shredded cabbage, salsa, and a homemade corn tortilla. Not as healthy as the salad I was going to make, but it was only 6pm, so it's early enough to have a little fired fish. Anyway, let me just tell you that I wish I had ordered 5 of these tacos!